Other names: Common Evening Primrose, Evening Star, Weedy Evening Primrose, German Rampion, Hog Weed, King's Cure-All, Fever-Plant, Night Willow-Herb, Scabish, Scurvish. Habitat: Evening Primrose is native to eastern and central North America, and is naturalized in temperate and subtropical regions of the world. Description: Evening Primrose is a herbaceous, biennial plant, growing up to 1, 5 meters in height. It has long, lanceolate leaves, produced in rosette during the plant’s first year, and arranged spirally along the stem during the second year of its growth. The flowers are small, four-petaled, produced on a tall spike. They are pale yellow in color, and appear from late spring to late summer. The flowers have an unusual behavior: they open in the evening, and close by the following noon. The fruit is small and capsule-shaped, with numerous seeds. 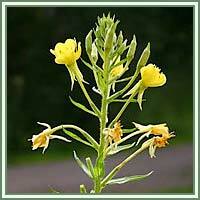 Medicinal use: Evening primrose, mainly the oil obtained from the plant, has numerous health benefits. Traditionally, Evening Primrose had been used as a promoter of uterine contractions, and was implemented at the final stages of pregnancies to induce labor. Nowadays, it is believed that Evening Primrose can be helpful in cases of both male and female infertility and female hormonal imbalance. Due to its essential fatty acids, the plant can be used in hair loss treatment. 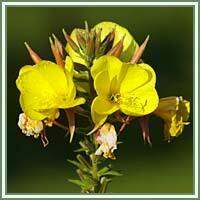 Evening Primrose oil can reduce skin inflammation in cases of rosacea and eczema. Oil can also be used in treatment of joint degenerations caused by arthritis, and can be very helpful in reduction of alcohol withdrawal syndrome. Safety: Some herbs could interreact with certain medication. Therefore, it is advisable to consult your doctor before consumption of any herb.